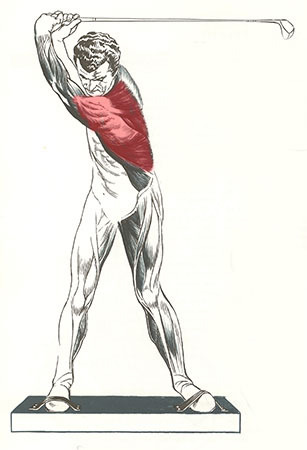 How do you coil your golf muscles? For power or speed or consistencies? Please look at the picture below and compare your muscle movement with picture. As you see here, it is such a powerful coil. Please look at upper and lower parts carefully. You don't see that much of rotation or turning of muscle in lower part (hip or belly or front thigh). The area of back pockets doesn't turn or rotate much, and it is only minimally coiled. However, we see quite a lot of coil in the upper part, chest or breast area. Yet, the direction of coil is more vertical, not horizontal. Please practice this coil as much as possible until coil of muscle will not be a discomfort anymore for you. Do you also see the touching point of chin and left shoulder? I will explain more of chin position at another article. Chin has to be UP a little bit, not down, in order to give an open area for left shoulder to turn flexibly. How about wrist cocking when shaft is on the top of back swing? This would be another point that will generate power with stability. Please note that the picture has originally been introduced by golf instructor Jim Mcleans as triple x-factor. I happened to come across this picture which I think it depicts such a powerful movement of muscle and coil. I hope everybody will learn and enjoy the picture. * Work From Home Training Place! * Control Golf Swing - eBook?